At this time, we are accepting no more applications! How she Arrived: Pepper came to the CCRT through an Ontario rescue. 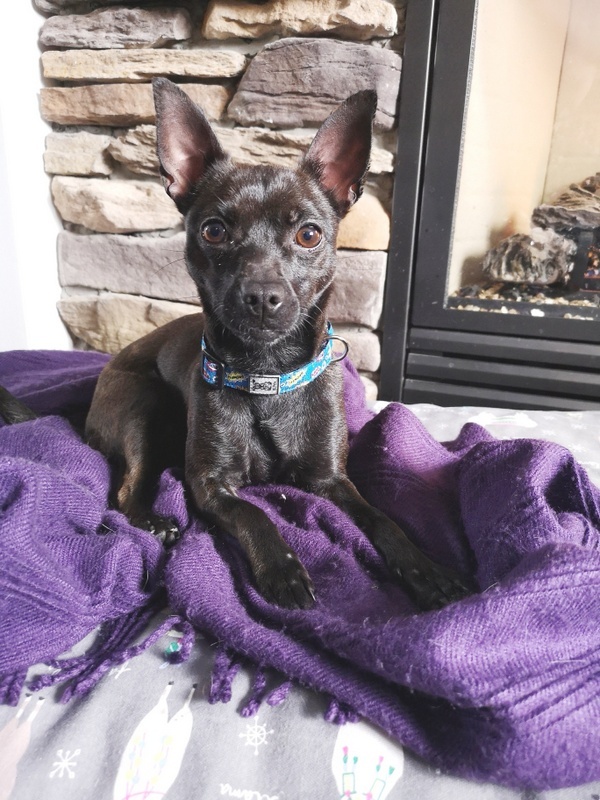 All about Pepper: Pepper is a happy, bouncy 12-month-old Chihuahua, who is smart and full of energy. She loves to squeak and de-stuff toys, chase bouncing balls, bark in excitement and just run around the house. She gets along well with other dogs and is fine with cats. She is a good-natured little pup who would do well on her own in the home or with another young and active furry friend to play with. Pepper is still very puppyish and needs a home that’s calm, stable and willing to help her learn and grow. Behavior: Because Pepper came into the CCRT with no previous history, we have no way of knowing what her life was like prior to the CCRT. What the foster home has learned is that she is reactive to change in the home. Meaning, she will bark at people coming in and out of rooms in the home but does settle down quickly. 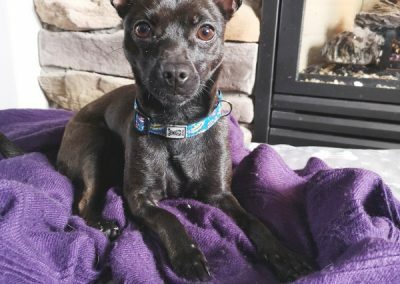 Pepper, like most Chi’s is a smarty pants and the foster home is sure this behavior won’t be an issue once she settles into a routine, receives proper guidance, and has regular exercise. Pepper does mouth at hands when feeling playful (which is often), although she uses teeth rarely. Nevertheless, she can get a little overzealous with this, so her foster home is trying to curb this behaviour. She does stop when asked and is easily distracted by exchanging a hand for a toy. Pepper walks well on a leash and enjoys checking things out. On her trips to local pet stores she seems to meet new people (adults and kids) well greeting with tails wags and going over for some attention but not before barking at them to say hello. Energy: Speaking of exercise, Pepper will need a lot of it because she is FULL of ENERGY. This gal is a jumping machine and will be an agility all-star for sure. Pepper is defiantly not a couch potato and she will do best with an active family. 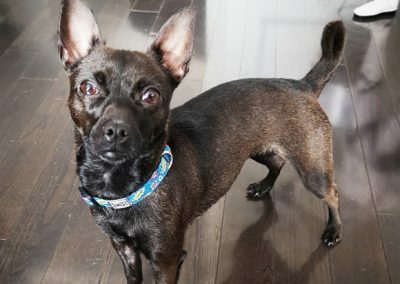 Her adoptive family will also need to stock up on chew toys and such as Pepper LOVES to chew, chew, chew on socks, toys, anything she finds is a fun toy for her. House Training: Pepper is fully house-trained She asks to go outside and understands what it means when asked if she wants to go out. Smart gal! Pepper loves to sleep in her human’s bed, under the blankets, in true Chi fashion! She will bark any intruders away from the safety of under the blankets! She bonds quickly to her person and will follows them around the house to see what exciting things they’re up to, pausing to protect them from any noise in the house if necessary. Security? No need when you’ve got Pepper by your side! She truly is a beautiful, smart little dog who just needs guidance, exercise and a consistent routine. If you think Pepper would make a great sidekick, please fill out an adoption application. You can purchase a sweater and/or blanket for her, or any of our other foster dogs. Spoke to Terry about adopting Pepper when she is ready. Please keep me posted on pepper, and when she becomes able for adoption. 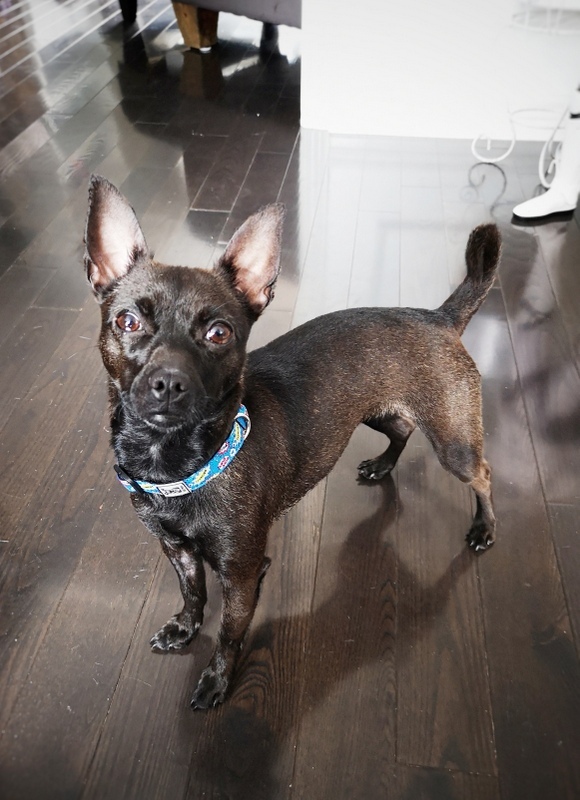 The best way to keep updated on Pepper is to keep an eye on his profile page right here. We will update it as we learn more about him! Is Pepper available for adoption now? If so, I would like to meet her. Terry knows that I’m interested in adopting her.